September 28, 2016: A bunch of songs sung by Trish Keenan because today would have been her birthday. Yes it was, I remember getting the shot in the school gymnasium. Some other wiseacre DJ suggested that this would be an interview with Trish from beyond the grave. How dare he! Irwin would never countenance such nonsense. Got enough Ouija boards, Irwin? Do they work better if you use more of them? Maybe stack 10 or 12 of them on top of each other? Sick burn on 7SD! I like it. This is worse than the Def Leppard version SM Ken played. Irwin what is your background music? Trish Keenan, hero. A friend once identified HaHa Sound as one of the greatest records ever, any decade, and I'm inclined to agree as the years go on. Mel: can't reveal just yet. A secret. Hiya, Irwin, and all. Glad I got here before the big reveal. Sounds almost like the guitar chords from Faith No More's 'Epic"
hooray!!!!!!!!! love broadcast. play "black cat"? voice! And thank you for playing my pale attempt to capture Broadcast's majesty, Irwin. 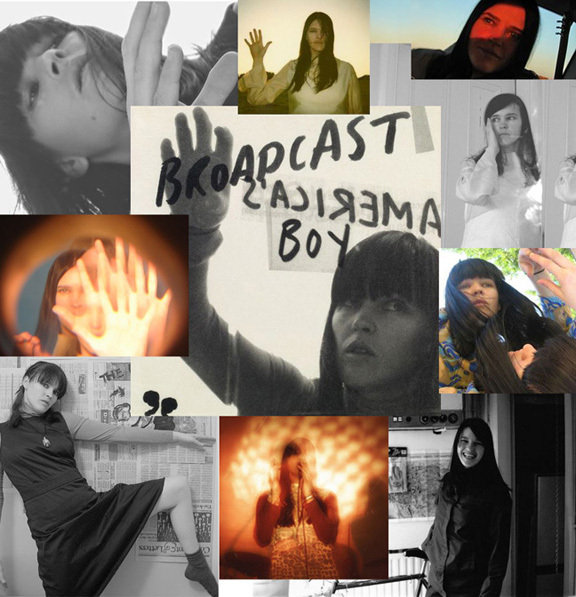 Monica Lynch introduced me to Broadcast by giving me their 1st US release (this album playing now). My favorite rendition of "Paper Cuts" is the live version from the Paris Black Session in 2000. The album cut is also pretty damn near perfect. I am new to Broadcast, but Trish Keenan had a beautiful voice! this is soo purty.. thanks, Irwin. Broadcast was a great BAND. And they wrote hauntingly beautiful songs. They were astonishingly good live, also! This is beautiful music, thank you Irwin- great show today. my favorites are "black cat" and "come on lets go"
I love "Black Cat" too, and "Michael Agrammar"
Remember DJ Trent? My first thought when I heard Trish had passed was literally "Oh no, Trent will be so upset!" That's "The Noise Made by People", singular. - & the price is right - the cost of one Admission is your Mind. record back in 68 and enjoyed it for many plays, but it was left behind after college. This song and The Book Lovers share references to Hermann Hesse's "Steppenwolf". Wow this Broadcast. A little like Stereolab w/ words, or His Name Is Alive around the edges. Wow. For those who are interested, James Cargill has great stuff on his Soundcloud page. listening, irwin. beautiful. huge credit to steve knutson - formerly of tommy boy and now the proprietor of audika (arthur russell releases) - who brought broadcast to tommy boy (via warp) and shepherded their projects there. Thank you for this. So much of this music is new to me. PRB - thanks, I had just been wondering what James Cargill was doing these days. We're not quittin' at 5:00. Trish forever! This music qualifies as "haunting", especially in consideration of her untimely exit. Great show! I like that you played The Presidents of the United States. I heard Broadcast first, and worked my way back to their influences. Some great music I may have never heard otherwise. Such as the White Noise LP. For a more recent band that's similar to Broadcast (and Stereolab) there's Death and Vanilla, from Sweden, who have some pretty good records out and about. Witch Cults for President 2016! I was there at that Maxwells show, which was I think with Pram? Thanks to Julie for letting her upside down bats know about this. @PRB I went to the Soundcloud and realized I was following it already :) He did post something new a few days ago. I'm not finding much in a general search. Broadcast was one of those signature bands that really made my return to college radio listening (after a long absence) so very memorable. I totally forgot about the Tommy Boy connection. I first heard of Broadcast when Drag City sent us a promo copy of "Work and Non Work". Instant crush! @Kat - Oh man, you're right! A new mix! Thanks for this Irwin! I was at that Maxwell's show in 2000. It was incredible. Saw them a bunch after too. Trish was pretty special. Sadly the last time I saw her was doing a duet at The Troubadour with Vincent Gallo. I choose to remember that first show though. Saw them twice: once right after The Noise Made By People, when they still had a full band; and again on their last tour co-headlining with Atlas Sound. Growing up my folks only had 3 Beatles albums, the 1st Bee Gees and the United States of America, which my father had been given by a friend who was managing them. When I got a little older I could never understand why no one knew the USA, having no idea that there were lots of records/bands in the world and lots of them got signed to Columbia in 1968! Not a lot of that caliber however....as with Broadcast. I saw them @ El Ray Theatre-2000. Fabulous! Love this show. Wow - great to hear the us of america. Didn't recognize it til the line, "and the price is tight, the cost of one admission is your mind" & it was like i heard it yesterday. Don't remember where I heard it, but it seems like somebody played it quite a bit. Maybe on WNEW? Or it could have been FMU. Don't know. "All Broadcast's songs sound the same," said no one ever. In and out of the house & car this afternoon. Cracking show today, Irwin! The tone of the organ (or whatever that is) on this song slayed me the first time I heard as a college freshman and it still does. I love the way they record the drums, with so much air around them. I think they recorded them in a church for one album. This is a little like learning about Scott Miller on efd's - exactly when it was too late. Mind-blowing, exciting & deeply sad all @ once. @RevRabbit better late than never. I'm still upset about Scott Miller too. I was a Game Theory fan for years. Found out only then that he was only two weeks older than me. I MUST HAVE THIS SONG!!!!! I have definitely never heard this before. THANK YOU. I'm learning a lot and listening to a lot of great music here. Thanks. Definitely going to have to re-listen to this when I can JUST Listen and not have to do other things. I wondered if this was the same Broadcast! Like a combination of Syd's Floyd W/ U.S. of A. & Stereolab. Stunning. & not a little lysergic. I might get in trouble for asking but what genre would Broadcast fit into? Back in the early 2000s, I caught a few artists with a 1960s retro feel to them..The Bristols, April March and Dallas just to name a few. Lots of Britpop came out around that time but I'm not sure how other fans of Broadcast feel about the term. Always wondered. There is an excellent John Peel sesh with an absolutely incredible version of "Long Was the Year." You've come through again Irwin. Gorgeous set from a long under recognized band. I had no idea of the Monica Connection. The woman is everywhere!! That collab was the gateway to all the wonderful Ghost Box Recordings artists / releases, including a solo album by former Broadcast keyboardist, Roj. They were such amazing songwriters! There is always a great tune in there, no matter how zany the rest of the track gets! Thanks for resurrecting Ms. Keenan, Irwin. This has been lovely. Except for "Michael A. Grammar", I wasn't familiar with any of this. Thanks for all the effort that went into the show. Thanks for the info for follow up, Danny and Seth. Thank you all for coming to Trish's birthday party. Tragically, she could not be here. But she provided the music. Thanks, Irwin! And thank you, Trish. thanks for the tribute, Irwin! Tuning in to your show after many shows Irwin, today. Blown away by the late Ms. Keenan. What was the song with the line, "All Circles Mesh"? What was the song with the line, "All Circles Mesh?" @Thomas Smith: if you ever come back, sir, the song is "The Be Colony" by Broadcast and the Focus Group (though I think the line is "all circles vanish").